This hacking project was made in collaboration with ADEO a group that owns many tool brands such as Dexter. We brainstormed as a team and came up with many funny ideas to hack products selected among a thick catalogue. I got to work on printed accessories for standard 120mm paint rolls. Open the SolidWorks 2010 file and change the text in the appropriate function. Remember that the text has to be written backward to be printed in the good direction. Don't make your letters too thin. Also, give a slight angle to your text so the paint roll works smoothly. If you want to replace the letters by patterns, feel free to experiment! Extrude approximately 2mm from the cylinder. Repeat around the shape until the pattern is regular. For the massage roll, be creative. Look on internet to get inspiration for new textures. This step, once you experted the .stl file and sliced it with the printer's software, should take 2-3 hours. Try to give it the best resolution possible. Makerbot replicator 2 gives you an amazing 0,1mm layer! If your resolution isn't good enough, a little bit of sandpaper 500 will do the job. Remove the plastic peg in the paint roll and insert it in your freshly printed roll! 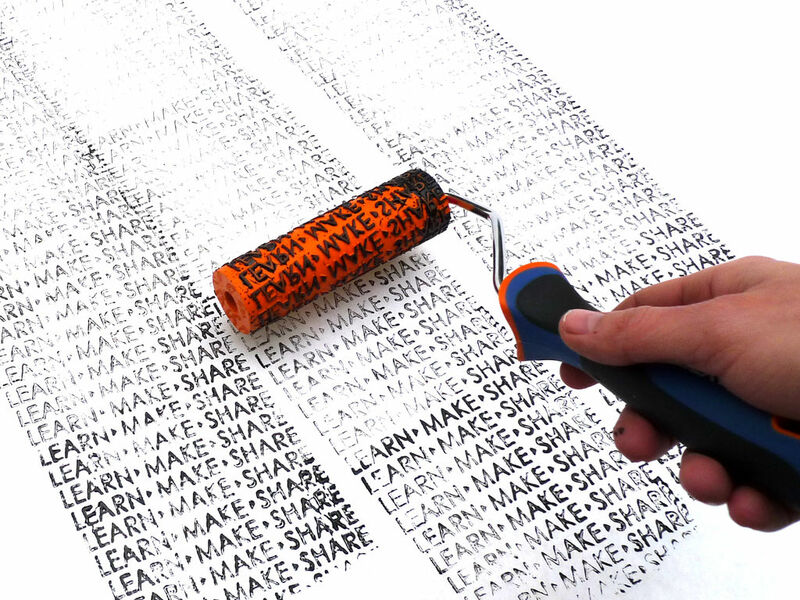 Spread the paint on a smooth surface and roll your text in it until all the letters are covered. Or... use the massage option to make someone happy and improve your Karma. I, too, do not have easy (or any) access to a 3D printer at the moment, but to correct a missing element on an existing printed product, I need a roller that produces a specific halftone pattern, so, just a bunch of little raised dots (around 1/16" diameter dots in rows spaced 1/8" apart, then the next row is staggered and placed a little less than 1/16" down from the first row, so its dots fall in the spaces between the dots above, and so on...) I've been Googling on and off for days and so far cannot find any company that accepts submitted designs for custom paint rollers. Don't have access to a 3D printer but compromise will get you far :) great idea, you've got my vote! i wish instructables that required tools and machinery that aren't in the average workshop - like 3D printers and Laser Cutters had a badge or something on the thumbnail. so i wouldn't get all excited to view the steps and get to "put design in your 3D printer..."
There was a kind of Byzantine Seal that was essentially a roller containing a sort of certification of authenticity. Is it possible to do this with any of the freely available packages? I'm trying Makerbot Customizer. It might work. Maybe this weekend. This would work great to roll impressions into clay. now i know what to do with my used paint rollers! That is a neat idea. Graffiti swipes! yes...yes ...yes...Simple but effective. I want a dozen! Sam! You guys are the best! Keep up the great work. Cool Sam! As an alternative and quicker manufacturing method you could laser etch some plastic then wrap it around the roller.